tyrannical boss, Mr. Drudge, just like Dagwood's Mr. Dithers. It began on September 6, 1976, and was distributed by The Chicago Tribune Syndicate, just like Winnie Winkle, Kudzu and many other comics about ordinary working people. 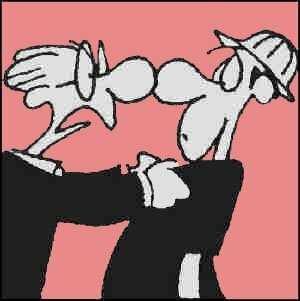 Where Dagwood differed from Mike was that Dagwood was an office worker for the Dithers Construction Company, whereas Mike worked for Drudge Industries on the actual construction end. Also, Dagwood's kids stopped getting older when they were in their teens, whereas Mike's son Truman eventually grew up and, with his wife, Tacoma, gave him a pair of grandkids (who, living in a different metropolitan area, never became prominent enough characters to have names). Mike's wife's name was Mabel. Her maiden name was never specified, but she had an older brother and sister-in-law, Abel and Buffy, whom Mike didn't like very much. Part of the friction was caused by Mabel trying to "put on airs" by making Mike shave and dress up for their first visit  he wound up wearing a formal white tie for the occasion, even while sporting a pair of black eyes, which he presumably got in a dispute with Mabel, and displaying a tear in his pants that revealed his underwear (which Abel and Buffy were polite enough to ignore). Mike's next-door neighbor, Earl Bird, was his best friend and also a co-worker at Drudge Industries. The fact that Earl and his wife, Abigail, were black provided an opportunity to touch on storylines that explored (not very deeply) topics relevant to American life of the late 20th century, such as suburban white flight and race relations in general. Mike's Russian friend, Yuri, provided an occasional glimpse into the Cold War, especially during the Gorbachev years (tho he was once seen operating a post-Gorbachev gambling casino in Moscow). The strip was created by writer Tom Forman and artist Ben Templeton, who were also responsible for The Sporting Life, Elwood and Prime Time. Forman died in 1997, and Templeton took on both parts of the creation. It appeared in about 240 newspapers. Like Dagwood, Mike later became the webmaster of the company he worked for. Unlike Dagwood, he was disastrously inept at the task. In 1999, like most of the world's webmasters, he prepared for the transition into the new century  but mistakenly got ready for Y3K, rather than Y2K, resulting in the utter destruction of the entire strip. On Monday, January 1, 2000, a "This space for rent" notice appeared instead of the usual daily episode, and that was the end of Motley's Crew. Text ©2010 Donald D. Markstein. Art © Tribune Media Services.